Inventing the Future is a bold new manifesto for life after capitalism. Against the confused understanding of our high-tech world by both the right and the left, this book claims that the emancipatory and future-oriented possibilities of our society can be reclaimed. 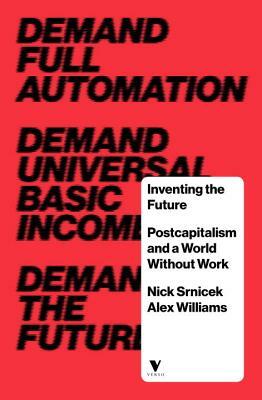 Instead of running from a complex future, Nick Srnicek and Alex Williams demand a postcapitaiist economy capable of advancing standards, liberating humanity from work and developing technologies that expand our freedoms. Nick Srnicek is a lecturer at City University. He is the author of Platform Capitalism and the forthcoming After Work: What's Left and Who Cares? (with Helen Hester). Alex Williams is a lecturer in the sociology department at City, University of London. He is the author of the forthcoming Hegemony Now (with Jeremy Gilbert). —Mark Fisher, author of Capitalist Realism: Is There No Alternative?